Bitcoin: Is $1,000,000 Just 2 Years Away? Many experts believe the digital currency still has lots of room to run. 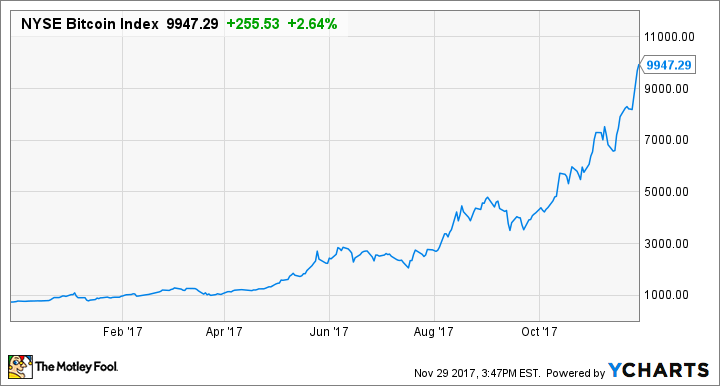 Bitcoin recently broke $10,000 for the first time ever -- a remarkable run considering that the digital currency started 2017 below $1,000 and was worth pennies just seven years ago. However, many experts are predicting that there is still much more upside. In fact, two notable financial experts recently predicted that bitcoin will hit $1 million by 2020. That means it would be worth about 100 times its current value in just over two years' time. Whether this happens remains to be seen, but here are the bull and bear cases for bitcoin. Bitcoin has increased more than tenfold in 2017, and continues to rise rapidly and in a volatile manner. In fact, in the 24 hours before I wrote this, bitcoin smashed through the $10,000 price point for the first time, and $11,000 just hours later, before dropping sharply to about $9,900 -- where it sits as I finish typing this sentence. Although bitcoin's rise to $10,000 has been extremely rapid and some observers are calling it a bubble, many experts believe that the digital currency has much more upside potential. In fact, John McAfee, CEO of MGT Capital Investments, told CNBC that bitcoin is headed to $1 million by the end of 2020, and author and former hedge fund manager James Altucher agreed. In fact, I've written that bitcoin could potentially reach $1 million (though not by 2020) if it catches on with consumers and merchants around the world. Other analysts are more conservative, but still see upside in the near future. For example, former hedge fund manager Michael Novogratz recently said that bitcoin could "easily reach $40,000" by the end of 2018. For one thing, the value of all of the bitcoins currently in circulation is about $164 billion, based on a price per coin of $10,000. This may sound like an enormous amount of money, and it is -- but consider that the global money supply is estimated to be about $68.7 trillion, and that bitcoin represents roughly 0.2% of this amount. A value of $1 million per bitcoin would translate to a total "market cap" of $16.4 trillion, so if bitcoin became a mainstream, international form of readily usable currency, it's conceivable that it could make up roughly one-fourth of the world's money supply. Furthermore, a recent study found that as many as 3.79 million bitcoins may be lost forever. There are a variety of ways that bitcoins have been "lost" -- for example, when they were worth just a few cents, holders weren't always careful about remembering their private keys to unlock the coins. So the actual value of the usable bitcoins in existence could be much lower. Also, unlike in other currencies, there are a finite number of bitcoins that will ever exist. Only 21 million will ever be in circulation, so there's a solid argument to be made that as the U.S. dollar and other currencies inflate over time, the value of a bitcoin in terms of those currencies will inherently increase. To be clear, I don't think there's much of a chance that the price of bitcoin gets to $1 million, or anything close to that figure, anytime soon. However, since the overall value of the bitcoins in existence is relatively small, the many predictions for bitcoin prices of $25,000, $40,000, or higher in the near future aren't exactly outlandish. It's fair to say that speculation has been the primary fuel for bitcoin's 2017 rally. Because bitcoin isn't yet a widely accepted form of payment, many people are buying the digital currency in the hopes that it will become a mainstream form of currency in the future. Bitcoin is incredibly volatile, as I mentioned; before it gains traction as a currency, this will need to subside. Bitcoin isn't easy for the average consumer to use. Bitcoin isn't widely accepted by merchants yet. Bitcoins can be (and have been) stolen through hacking; the potential is an obstacle to mainstream use. The blockchain in its current form could not handle the transaction volume if bitcoin were to become widely used. Other notable experts like JPMorgan Chase CEO Jamie Dimon have been very critical of bitcoin, even calling it a "fraud." Others have said that there is value in the blockchain technology, but not necessarily in bitcoin itself. While statements like these may be a bit harsh, I'd say that if bitcoin doesn't show signs of increased use as a currency, not just as a speculative investment, the value could certainly drop. The bottom line is that bitcoin is still volatile and speculative and should be approached with caution. While a price of $25,000, $40,000, or even $1 million per bitcoin is indeed possible, I believe that it's equally likely to fall to $1,000 or less. It all depends on how quickly (if at all) the digital currency overcomes its challenges and starts to become mainstream.